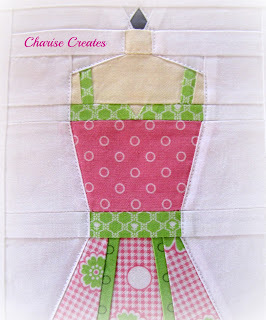 Charise Creates: Quiltmaker Spring 2013 - Give away! I'm hosting another give away in celebration of my wall quilt being featured in Quiltmaker Spring 2013!!! You may recognize the middle block which was in Quiltmaker's 100 blocks Issue 6. 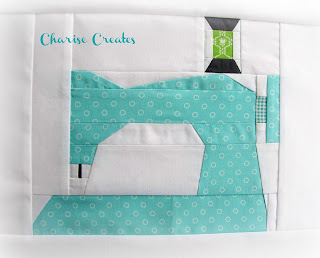 I added a sewing machine and iron to make a fun sewing room theme quilt. Then I added a beggar block border to add to the vintage charm. Here is a picture of the original design. The fabrics were generously donated to me by Moda fabrics. 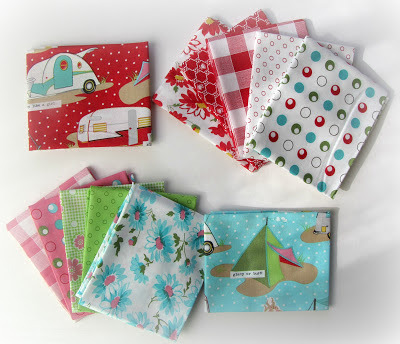 I think it only fair to share the love so I'm giving away a bundle of Glamping fabric!!! I will be giving away a FQ of each of the two "glamping" prints and a F8 of all the rest! Please leave a comment below and one extra if you are a follower of become a follower. Give away is open for international participants and I'll pick a winner on March 10th. Comments will close on March 9th at midnight PST. Charise that is so cute. Congratulations on the publication. Glamping is such a fun looking line. Thanks for hosting a giveaway. count me in for following too please. Congratulations, I saw this over at Quilt Maker (and hope I win a copy). I am a follower with Google Friends. What a lovely fabric line. Thanks for the chance to win! Congrats Charise, so much is happening for you at the moment, you are a creative power house! Congratulations! Your quilt is quite lovely. In your blog it states "I'll pick a winner on Feb 10th. Comments will close on Feb 9th". I think you meant to put March 10 and March 9? The wallhanging is beautiful! And I really love the fabrics you are giving away! I am a follower! And I am hoping you have your dates mixed up...and that you mean March! Otherwise I will be so sad to have missed the chance! I purchased Quiltmakers 100 block with your dresses in it. I just loved them. I have been following you ever since. Just love all of your projects and look forward to seeing what you will post next. Thank you so much for the Block of the month freebies. Also thanks for the chance at this great giveaway. Congratulations! Your wall hanging is amazing. I love it! Congratulations! It is a lovely wallhanging! Love the colors very much too, so fresh! And I am a follower of your lovely blog! I love the colours in the fabrics you used, they are so fresh. 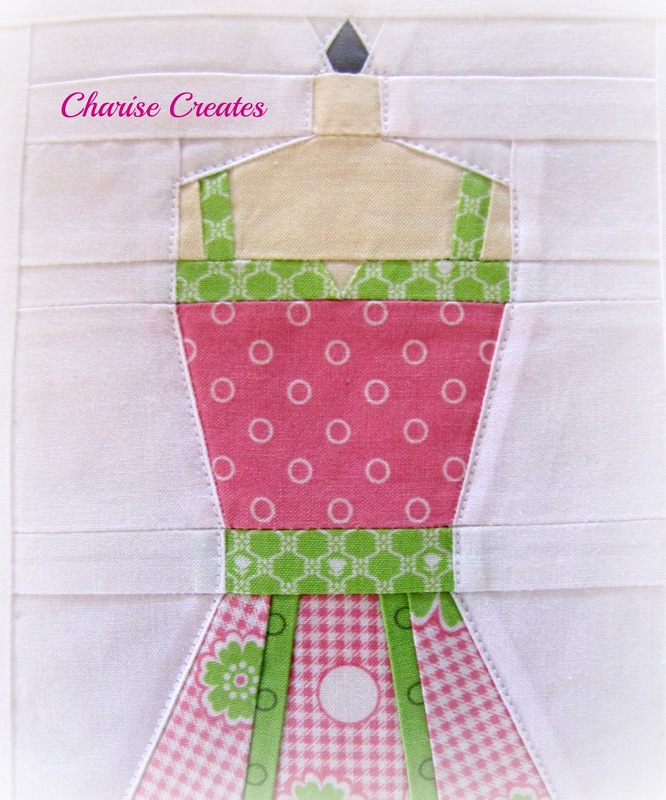 What a cute wallhanging, would be perfect for my sewing room. Great fabric too. I love that wallhanging! I love paper piecing and you have made it where all the details are so enhanced. Beautiful. Thanks for the chance. I'm a happy follower. Thanks for the chance. Congrats on the magazine! Your quilt is just wonderful! Thanks for the giveaway.... you always choose the best fabrics for your projects! Your patterns are the most unique ones out there in the market. Its always fun to see what your coming up with! Thanks for a chance to win! Congratulations! Such gorgeous work and pretty fabrics! I love this wallhanging! Would love to win, thanks for the chance. Congratulations on the publication. I am a follower too. You make a great cover girl! I love the wall hanging in those fun fabrics. I'm a faithful follower. So much fun to see you in print, as well as on the blog! As I've said before, my absolutely favorite blog to follow! So lovely...going on my to-do list! Pick me! pick me! I'm a follower. I love your wall hanging, it would look great in my sewing room.... just saying. How can you pick a winner on Feb. 10th? you do mean March LOL thought I'd missed something along the way for a moment... Have a wonderful Spring. I just love the dress pattern. and the fabric line is great. than you for a chance to win. Congratulations on your publication, it is such a beautiful design!! Congratulations and thank you for a fabulous giveaway! Oh, I love your little quilt ~ that iron is wonderful! Great giveaway ~ thanks for the chance! 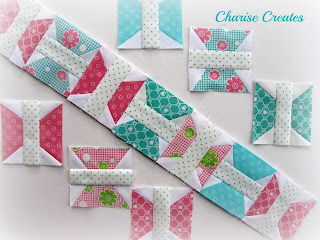 Love your designs, Charise. I am a follower, both on your blog AND on Pinterest. I'd love a chance to win the yummy Moda "Glamping" fabrics. I'd love a chance to win those cute fabrics! That is the cutest wallhanging! Thanks for a fabulous giveaway. I'm just starting paper piecing and am loving it and your designs! It's nice to see what can be done with these little blocks! ...and YES, I follow you! I love your patterns! Congratulations on being published! I am a follower for sure! Thanks for the chance to win these lovely fabrics. Your patterns are so cute! I just love that quilt. thanks for the giveaway. Congratulations. That is awesome. I love the fabrics that you used. I just have to tell you that I really love that quilt and I am looking forward to getting that magazine. PS if this entry is drawn, please redraw. I just wanted to let you know that I loved the quilt. I love the wall hanging. You have such a gift for designing wonderful blocks! And the fabrics? How fun those are. I'd love to be able to play with them! I love your wallhanging....your sewing is impeccable! I love that dress block so much! It is on my list of projects I want to do! Congratulations - those dresses are adorable! Your little quilt is adorable! It's no wonder it made it into the magazine! I love the border block that you chose to use. You are so talented, I absolutely adore your work and patterns! Thanks for this giveaway! Love your quilt! It's so adorable! Thanks for the giveaway. Beautiful, congratulations!!! thanks for this wonderful giveaway. OoOOoo my fingers are crossed - that is some seriously cute fabric :) Congratulations on the QM feature - that's awesome! Wonderful fabric - so hoping I win! I guess you don't have any idea how much you inspire me <3 - sewing your blocks is such a pleasure. Greets from germany! Congratulations. The quilt is sew cute. Very cute wall hanging! I am going to have to buy that magazine! Totally loving this! Doe this mean there will be a pattern in the magazine? Or will you be writing one for us to buy? I would so love one of these in my sewing room! Have been following for a while now! I love your wallhanging! Thanks for sharing! your designs are so lovely. I'd love to win the fabrics. I absolutely love the addition of the iron... it is all so great! Congratulations, Charise, on the many publishing accomplishments you've had lately! This wall hanging is just as wonderful as the rest! Thanks for the giveaway; oh, I'm a follower, too! Congratulations! I love all your paper piecing blocks and the fabric. Just found your blog via Pinterest. Love it! thanks for the chance to win. Love those dresses on the dress forms! Too cute! Your blog is definitely one of my favourites. 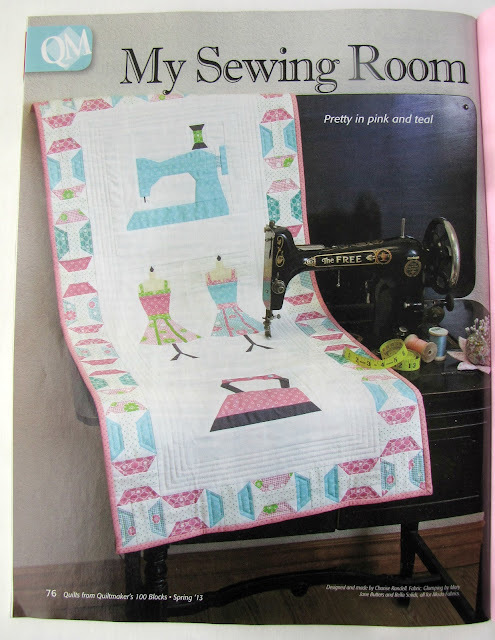 I love this wallhanging...I'm going to get a copy of the mag and make this beauty for my sewing room. Love the fabric, too. Thanks for the giveaway. I am a new follower. Can't wait to see what's next! I LOVE LOVE LOVE LOVE LOVE your patterns! And a big thanks for the giveaway. p.s. I LOVE LOVE LOVE LOVE LOVE LOVE your patterns! I too am a follower!!!! Congratulations! I adore your quilt and patterns! Thank you so much! That is an adorable quilt. ♥ that "Glamping" fabric, too! Thank you for having a giveaway of a few FQs of it. I follow Charise Creates via feedburner. Thanks for another chance in your lovely, glampy giveaway! Cute fabric and an even cuter pattern! I'll be on the watch for the magazine. I'm also a follower by email! Sus patrones son increíbles. Estoy feliz por usted.Gracias por compartir. Desde luego soy seguidora por correo electrónico.Cariños. Your wall hanging is just lovely. So inspiring! I love your wallhanging! 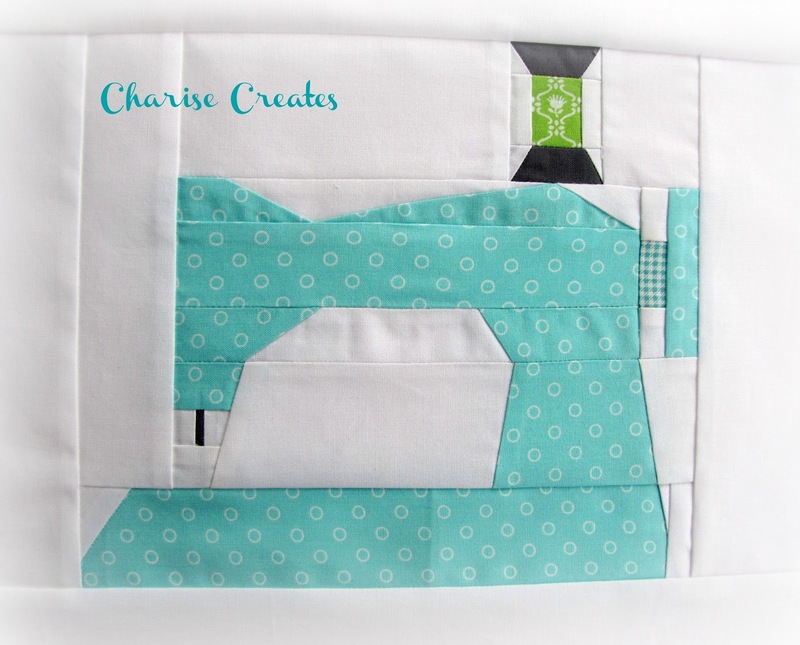 I love your style of quilting...it's so fresh & eye pleasing! Thanks so much for a chance at the give-away. I am definitely a follower! Love your blog! Love it, love it, love it!!! I've been looking at the Glamping fabrics and trying hard to resist, but if I were to win some of these then the only decision left to make would be what to make with them. Your wallhanging would be high on the list of possibilities! ADORABLE project! LOVE it! Think I need to make one for my BFF! Oh yes...I'm a follower by e-mail. I don't do Facebook. Thanks! This is a lovely quilt.Congratulations on bein published. I am a follower. I love the many things you come up with and share. I am a follower. Thanks for a second chance! I hope you made time to visit SewExpo this last weekend. What a great party. On Sunday, we watched as five sewing bloggers auditioned for a space on the sewing show "Sew It All TV" (http://www.sewitalltv.com/index.html). Congrats on spending the time and effort to get your items into this magazine. What a great honor. Such a cute wallhanging! You are so creative. Thanks for the fun giveaway. YES!!! I am definitely a follower and get every post you make in my email!!! Congratulations! Your wall hanging is sooo cute! Thank you for a chance to win some fabric! Love the fabrics. So pretty. Congratulations, it's a beautiful wall hanging. Thanks for the giveaway. Congratulations again! I love it! Thanks for the chance to win! I would love to win this gorgeous fabric! The quilt is beautiful as well; I may have to make one for my sewing room. So cute - love your pattern and the Glamping fabric! I follow you with Google reader - really enjoy your posts! Wow your paper piecing skills are AMAZING! Gorgeous little quilt! Thanks for the chance to win! Congratulations! What a deserving honor for such a beautiful quilt! Congrats on being published! I love your wall quilt. All of your PP patterns are simply amazing! Thanks for the chance to win! I have been a happy follower for quite some time! Thanks for the chance to win! Where did you learn to paper piece? I would love to get this good at it. Congrats on making the magazine! I've just come across you from Quilty Pleasures blog. I just love your My Sewing Room quilt. I am a new follower! Thanks for the lovely giveaway. I have that magazine with your pattern in it, and its beautiful. What a pretty wall hanging too! Your quilt is SO cute!! I like the original block, and then what you've done with it! Thanks for the giveway! Congrats! I love your work. I think your pattern is so adorable! What a great quilt! Beautiful, I always love your designs! What a fun quilt - thanks for the giveaway!